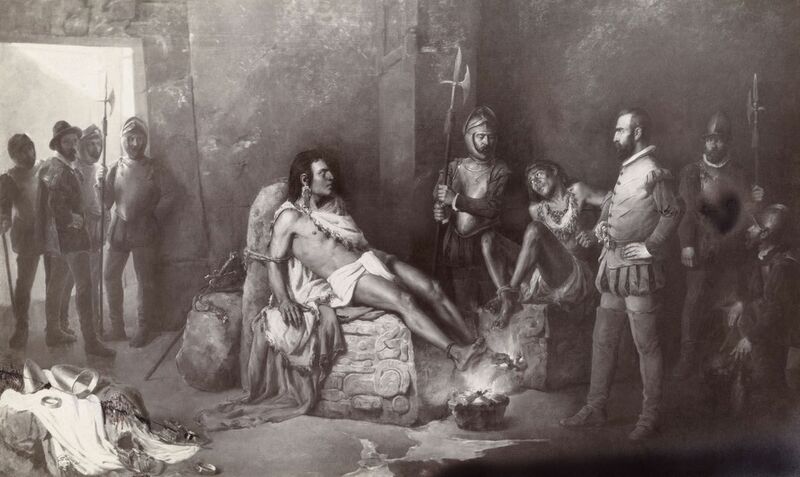 On February 28, 1525, conquistador Hernan Cortes ordered the execution of Cuauhtemoc, the last independent Aztec emperor. The Spanish conquistador Hernan Cortes ordered the brutal torture of the last Aztec emperor, Cuauhtemoc. Cortes burned Cuauhtemoc's hands and feet, hoping the torture would force the emperor to reveal secret stashes of gold. There were no secret stashes of gold, and Cortes hanged Cuauhtemoc three years after capturing him. On February 28, 1525, Spanish conquistador Hernan Cortes ordered the execution of Cuauhtemoc, the last independent Aztec emperor. Cuauhtemoc and Cortes had engaged in a series of fierce battles five years earlier. Cortes and an alliance of Tlaxcala and other anti-Aztec groups assaulted the Aztec capital, the island-city of Tenochtitlan. The Spanish group cut off supplies to Tenochtitlan, and rotting bodies (killed either in battle or by disease such as smallpox) contaminated the city’s water supply. The city fell, and Cuauhtemoc fled and ultimately surrendered. Convinced Cuauhtemoc was hiding secret hoards of gold, Cortes imprisoned and tortured the former emperor for three years. When Cortes led an expedition to what is today Honduras, he took Cuauhtemoc with him, where the former emperor was hanged. Cortes and other Spanish conquistadors established a series of colonial rulers, but today, Cuauhtemoc is remembered as a symbol of indigenous pride and pre-Columbian civilization in Mexico. Cuauhtemoc is a popular boy’s name, and a statue of the last Aztec emperor stands in the Zocalo, the central plaza of Mexico City—what was once Tenochtitlan. (1325-1521) area of land in Mesoamerica conquered and ruled by the Aztecs. Also called the Aztec Triple Alliance. to persuade or succeed in encouraging someone to believe completely. very contagious, often fatal disease wiped out with vaccination programs.